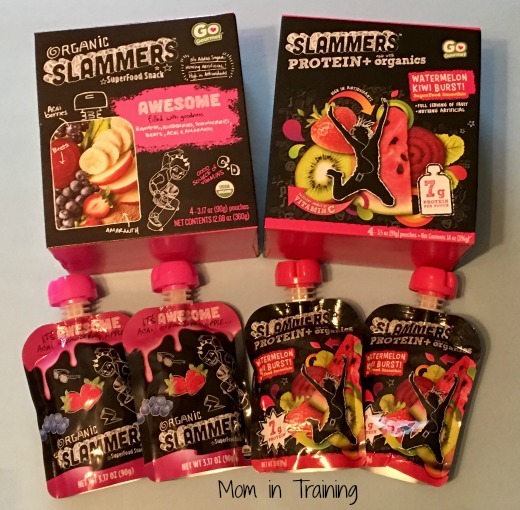 Slammers are a healthy alternative to sugar-laden snacks like cookies, cakes, chips, and candies. Each flavor introduces kids to fruits such as mangos, acai, yumberries, kiwis, and pomegranates, and serves as a great source of essential vitamins. And two of their new flavors introduced also come packed with seven grams of protein. We do alot of running around during the holidays and breaks from school so I always try to keep some sort of snacks with me for the kids (and myself too of course). I don't like running through drive-thru restaurants spur of the moment when the kids get hungry on the go because I know it's not the best for them. That's why I keep things like Slammers in a bag in my car for those "I'm hungry" moments. It's something the kids and I can enjoy on the go and not have to worry about any preparation ahead of time. Just twist off the cap and enjoy their naturally sweet flavor. And they come in awesome flavor combinations so there's lots of fruity goodness to enjoy! Flavor Combinations: Epic, Awesome, Chill'n, Pumped, Pomegranate Grape Crush, and Watermelon Kiwi Burst. These look like great healthy snacks the kids would enjoy. I haven't seen them while shopping yet, but I'll keep an eye out. This looks like an amazing healthy snack. This is awesome! I wish it was Non-GMO, but still a much better option than running to the fast food menu when hunger strikes. This looks like a yummy healthy snacks for kids. I think my niece would love them!